The Mike Schy Golf Performance Institute specializes in the coaching and development of collegiate and junior golfers. 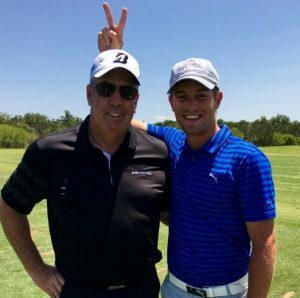 Mike's teaching philosophy and methods have helped many outstanding young golfers achieve a high level of success, including PGA Tour professional and recent Memorial Tournament Champion Bryson DeChambeau. In 2015, Bryson became the fifth player in history to win both the NCAA Individual Championship and the U.S. Amateur Championship in the same year, with Mike as his coach. Mike, who is also a FlightScope Advisory Board member, took the time to catch up with us following Bryson's big win at Muirfield Village. He explained why he continues using FlightScope to teach and what makes FlightScope the best in the game. MS: I first started using the Kudu about 7 years ago and have used FlightScope ever since! MS: I use the X3 because it is the best launch monitor there is! MS: FlightScope provides the necessary data that no one else gives you, like the Speed & Acceleration profile featured in the Video & VX Apps. They are always improving and making updates to their products, and are the most accurate and innovative in the industry. Not to mention they have the best support and customer service! They really care about the consumer. MS: If you are a developing junior, the mevo is a must-have. MS: Coaching the 2015 NCAA and US Amateur Champion, Bryson DeChambeau. In just 2 years since going pro, he is now ranked 2nd in top 10 finishes (9 total) and has had 2 career wins. I could not be more proud of him! To learn more about Mike, visit mikeschy.com.